In coming days, we’ll expose the conflicts of interest designated agents would prefer to paper over and the heartbreaking failure of the real estate regulatory system to protect ordinary homebuyers and sellers. 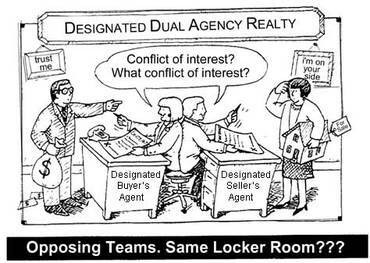 If you’ve been a victim of dual agency, designated agency, or other deceptive real estate practice, or know someone who is writing about the same subjects, please let us know. If you are in the housing market now, BEWARE designated agents; and demand a real buyer agent, like The Real Estate Cafe, who can help you save tens of thousands of dollars.